The Pionus Parrot is of medium build. This adorable and most quiet type of bird has a somewhat chunky body, bare eye ring, a short square tail, and hosts a scaly blue head. Their overall color shimmers with brilliance. The under part of the tail is bright red. There are no specific distinguishing marks between the male and female species. This species is found to be a native to Mexico and Central and South America. This parrot species looks similar to the Amazon Parrot, but this species is smaller, and the wing-strokes are deeper. Altogether there are a group of seven Pionus species, all with different colorings. One thing is for sure; the Pionus Parrot species is quieter than other parrot species. If you find that a parrot's constant noise is too much for you to bear the Pionus is for you. You can avoid these issues by meeting their dietary needs daily. These birds are prone to obesity which is why a strict diet is necessary. You are searching for the perfect Pionus and you want to invest in the more expensive Bronze-Wing Pionus the price tag is upwards to $900.00. The lesser expensive Pionus parrot price for the species called the White-Capped and found in abundance in the pet market. This Pionus type is a bit smaller and costs $200.00 to $400.00. 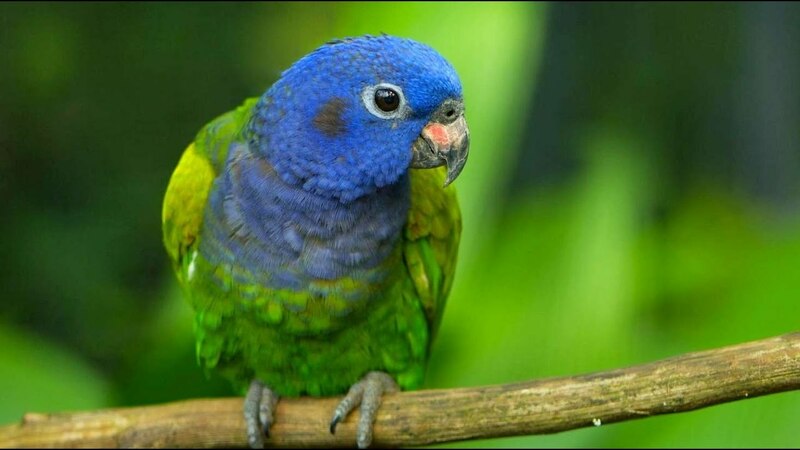 What is the Personality of the Pionus? This Pionus Parrot personality is not aggressive nor loud. If anything this bird is cautious, smooth going, quiet, and a bit standoffish. These birds like attention and are affectionate on their terms. There is an all-around sweet and attentive bird. This bird appreciates the time spent and deserves to have their owner spend time and shower attention on them. Unlike other bird species, the Pionus is not prone to any one person. However, never let a child in the home play with this bird as children tend to be rough and do not stop to think that they must be gentle with any bird, not just the sweet Pionus. If these birds become frightened, they make a hissing sound much as though they were having trouble breathing. When scared these sweet birds either stand still, try to flee, or may nip at their 'attacker.' Even though these birds are a quiet species, owners note that the noisier the household, the louder this bird can get. In spite of this, the Pionus makes a beautiful family pet. The Pionus parrot is capable of talking if you work with your bird. These birds do not carry a wide and varied vocabulary, but they do try hard. Their voice is soft and may sound a bit raspy, so you have to listen carefully. Even though you do not have to give your daily bird attention, they do need a small element of interaction. They are happy to play on their own and entertain themselves. I Do I Chose a Pionus Parrot? The first thing to consider is your budget and how much you feel you can spend, then stick to your budget and do not overspend. If your funds are limited, choose a White-Capped Pionus as these make lovely pets but are not nearly as expensive. If you want a talker, then you need to select a Blue-Headed or Maximilian Pionus. It would be best if you put a lot of time and effort into teaching these birds to talk, but once they learn their vocabulary includes over a dozen words. The Maximilian is the quietest of all the Pionus species and the most sociable. They like interaction and are happy to share their home with you. If you buy through a breeder make sure you review any consumer complaints about mistreatment, sickness or unresponsiveness of the birds. Look at breeder records and discuss medical treatment and vaccinations. Avoid buying through pet stores. Be sure to ask about the age of the bird. If your choice of bird is not ready to leave the breeder, make a weekly or bi-weekly appointment to interact with your bird through playing and talking. Make sure the breeder is prepared and willing to answer all your questions. The Pionus parrot is an excellent choice for a family pet. The Pionus is a loving and sweet bird and shows family members unparalleled devotion. Their living arrangements are best when given ample room, more substantial than a medium-sized parrot cage allows for more roaming room. These birds keep themselves happy and content if you supply them with an array of attractive bright colored toys. If you chose this type of bird for a family pet, be advised that with proper care they can outlive you at upwards to 40 years. Chose your bird wisely and considered their longevity of life.